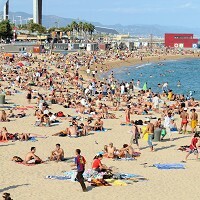 All-inclusive holidays in many parts of Europe may not be the bargains they first appear to be, according to a new study. In some areas of Portugal, Cyprus and Spain, holidaymakers would be better off booking a bed-and-breakfast trip, and eating out each night and buying their own drinks. The biggest saving the Post Office Travel Money survey found was a seven-day break in the Portuguese Algarve, where an all-inclusive holiday for a couple could be as much as £648 more expensive than a B&B break. Those booking a B&B package would pay £857 per couple compared with £1,505 for an all-inclusive package. While all-inclusive holidays were found to be better value-for-money in Corfu, Majorca and the Costa del Sol, the study found one in six people on all-inclusive trips had paid for a la carte meals in an attempt to avoid the repetition offered by buffet meals in many resorts. Andrew Brown, of Post Office Travel Money, said: "Our research has shown that European all-inclusive resorts consistently offer less than their long-haul counterparts, so holidaymakers need to be aware of what is included in order to avoid getting caught out. "We found that the all-inclusive route is not always cheaper. In some destinations like the Algarve and Spanish Costas, where restaurant prices have fallen dramatically this year, it may be cheaper to book a B&B package and eat out each day." No matter if you choose to go all-inclusive or B&B, you should not set off on your holidays without first arranging cost-effective travel insurance. The study looked at the cheapest seven-night B&B and all-inclusive packages for two adults departing from London airports available on June 21 for travel between July 24 and August 6 this year. All prices included return flights and three/four-star accommodation for two adults. For B&B packages the cost of evening meals, beer and Coca-Cola was added to the package price to provide a comparison with all-inclusive.